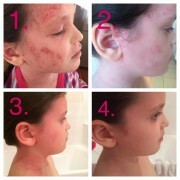 This is my 2 week update, using Dr. Aron’s treatment for my child’s eczema. They say that seeing is believing and if that is the case, then my daughter Elizabeth should certainly help many of you see what a difference this past 2 weeks has made. 14 days of Dr Aron and I don’t recognize this happy, cheerful, playful, smiley child. Before 2 weeks ago, she was always crying, itchy, screaming, miserable, not sleeping and it made all of us stressed to the max and downright sad. Her life revolved around wet wraps, gauze, bandages, anti itch creams, Atarax and daily baths that made her scream bloody murder. To say I was a prisoner in my own home is an understatement. I’d take her to the grocery store sometimes and I’d get asked if she had measles. Not now. 2 weeks ago I told her that we were no longer wet wrapping and that we were going to make her better. Part of me thought I was lying to her. 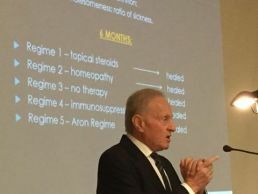 Most of me knew I was lying to myself because I really thought, like every other treatment, that this wasn’t going to work. Well, the joke is on me. Not only has it been working, it has worked in a way I can’t even comprehend. We started out at 5 applications a day and are now down to 3. I’ll be contacting Dr Aron in a couple of more days, as he requested, and I’m hoping to drop it down even further. I’ll do another update in a week. That should be a good one because she will see our family doctor and he hasn’t seen her since a week before this treatment started and I’d taken her in because she’d torn her arm open again. Last time he saw her, it looked like she was attacked by a cheese grater. For moderate cases of eczema too! Bath Time is Fun Again!